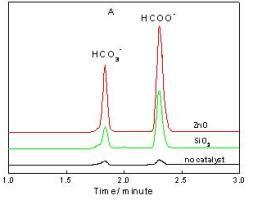 Photocatalytic oxidation of formaldehyde (HCHO) in K2SO4 solution using ZnO or SiO2 as catalyst under ambient conditions is studied. The effects of UV illumination time, catalyst (herein, ZnO or SiO2) content (m/V), HCHO initial concentration, pH, and K2SO4 concentration on the photocatalytic oxidation of HCHO are determined. The presence of SiO2 (1.0 g/L) can enhance the photocatalytic oxidation of HCHO (2.0´10-2 g/L) from ~7.1% to ~19.2% after illumination time of 24 hours. The photocatalytic oxidation of HCHO is dependent on pH value, but independent of ionic strength. The results are important for the application of natural sand (SiO2) in the treatment of HCHO pollution in the eutrophic solutions, and for the evaluation of the elimination of organic pollutants by photocatalytic oxidation in the environmental pollution cleanup.